By about 10:30am, our cruise boat had been crusing for about 10 minutes from the docks, and our group of 5 had taken our seat on the upper deck of the Lianfeng08 cruise boat, and we were enjoying the cool wind, hot sun, and the beautiful scenery that surrounds us. A photo of me on the upper deck of the cruise ship. The Li River scenery was stunning. Everywhere is green, green, and more green. The mountains and hills on the river side are green, and the water is a deep green. Being there, you will feel peace and calm. Even the sky is a clear blue sky (most of the time). Of all the cities I've been to in China, the Li River is probably the only place where I've seen so much clear blue sky. 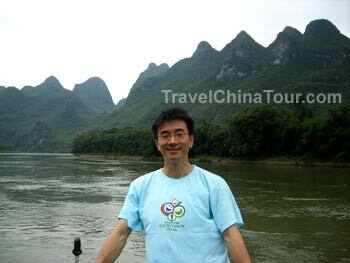 However, it would seem that pollution has taken its toll on the Li River over the past 2 decades. There was a Chinese couple from Vancouver that I met on the boat. The husband told me he had been to Li Jiang once before over 15 years ago, and the last time he had taken a cruise down Li River, the river had clear green water where you could see all the way to the bottom. Now, however, the water is no longer clear - although the Lijiang river is still a deep green color. We had been cruising for a little over an hour on the Li River, with plenty to see along the way. What happened next was completely unexpected. As we were cruising down the Li Jiang Li River, there were some gasps among the tourists, and I looked over the side of the ship. I saw 2 fishermen on a small bamboo raft heading straight on toward the side of the cruise ship - it looked as if they were going to ram straight into the side of the cruise ship with their bamboo raft. 2 fishermen selling their Li River catch to the kitchen onboard. As they neared the cruise ship, they turn the bamboo raft on an angle to line up parallel with the cruise boat. 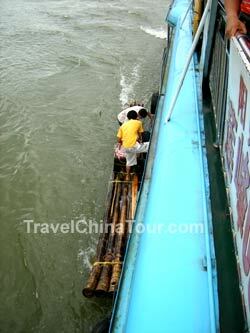 Once within arms reach, one man grabbed hold of the side of our cruise boat and pulled the bamboo raft up to the ship. I'd bet that some tourists prbably thought they were pirates. :) At this point, the tour guide's explained to everyone on the ship that these fishermen were selling their catch to the cruise ship, and for the people who ordered the full course meal, they will be served fresh seafood from the Li River. See our lunch on the Li River Cruise Ship.